We got just a little bitty sprinkle yesterday, though on our way to meet Sarah we went through actual rain. What a disappointment to come home to everything just as dry as when we left. We had a few drops later on in the evening--I happened to look out and notice the look to the sky. I went to look from the porch and this rain bow is what I saw. So, we are still dry...and it was at 96ºF all afternoon. I hung out a load of Roger's t-shirts late this evening...they were out about an hour and were dry all except for where the clothespins were. We have been having a few fresh tomatoes for a few days...at first just one every now and then. Now there are a lot getting red. They are soooo good. I just cannot get all I want. Now, if I only had some fresh corn! The tomatoes sound so delicious. Sorry you got so little rain, though. The rainbow is so pretty! We had a couple small sprinkles this week....at bit of hope at last! Sorry the rain missed you. You have made me hungry talking about your tomatoes! Have a good week. I love vine-ripened tomatoes! Nice picture of the rainbow. We have been getting just a little rain. We need more. A pretty rainbow. Sorry it didn't also bring some much needed rain to your place. Fine ripened tomatoes sound SO good! Love the rainbow! We've just started to get a few tomatoes off the vines, but they are small. I've watered them nearly everyday. We are in desperate need of rain here! I feel sorry for the farmers. It must be quite draining on your energy to have high temps all the time like you have. Lucky you having fresh tomatoes - I bet they are very tasty. Fresh tomatoes sound good! 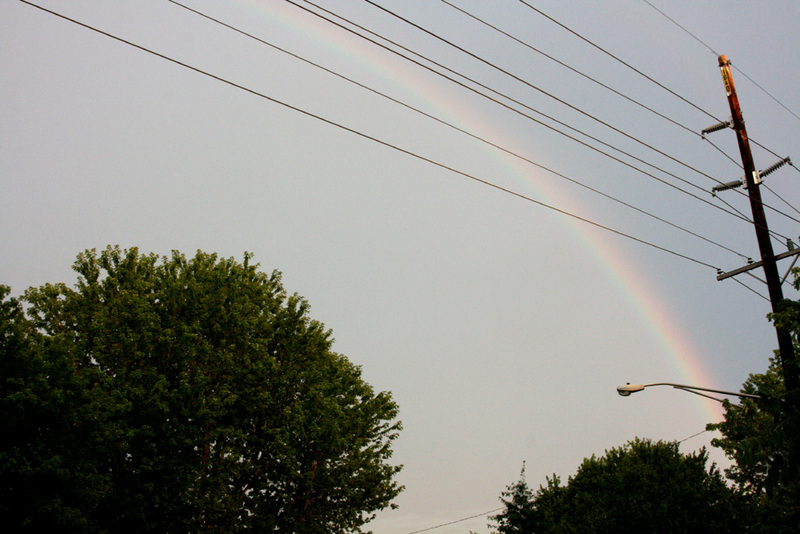 The rainbow is cool, but sorry you didn't get more moisture. A sprinkle is better than nothing....and you got a lovely rainbow too. Hope you get more soon, though.